The Sunlite antique sconces include 1, 2, and even 5 socket fixtures in brass, bronze, pewter, antique black and copper finishes. Some options are caged or shaded, while others let the beauty of the bulb speak for itself. Perhaps the most interesting fixture is the piping system wall sconce, which accepts 5 bulbs and is fixed with a decorative pressure gauge. Sunlite antique pendants come in black finishes and shades and are also offered in retro glass-shade options. All Sunlite vintage pendant lights are fixed with a standard socket and are suspended from a rod, chain, or fabric-covered cord. 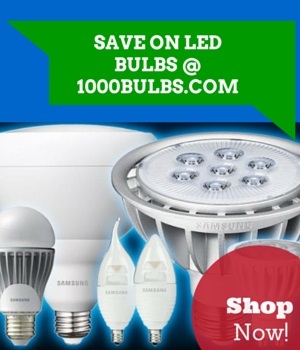 The best bulb type to use for each fixture varies based on design. For example, customers should consider using a long, tubular-style bulb for the antique tall glass cylinder pendant, or a round, globe-style bulb for the glass trapezoid. Sunlite Lighting was founded in 1980 by Morty Kohn as a one man operation and has since evolved into a multinational enterprise. The company works tirelessly to introduce new and innovative products to the marketplace. Although 1000Bulbs.com has always supplied the parts necessary for customers to create their own antique fixtures using sockets, cords, plugs and cages, these new Sunlite fixtures offer even more options for displaying 1000Bulbs’ substantial selection of historical bulbs. About 1000Bulbs.com: 1000Bulbs.com is an award-winning Internet-based lighting retailer. The company offers a wide array of innovative products at great prices to homeowners and businesses across the US and around the world. Nationally recognized for growth, innovation, and customer satisfaction, 1000Bulbs.com is an influential force in the lighting industry.